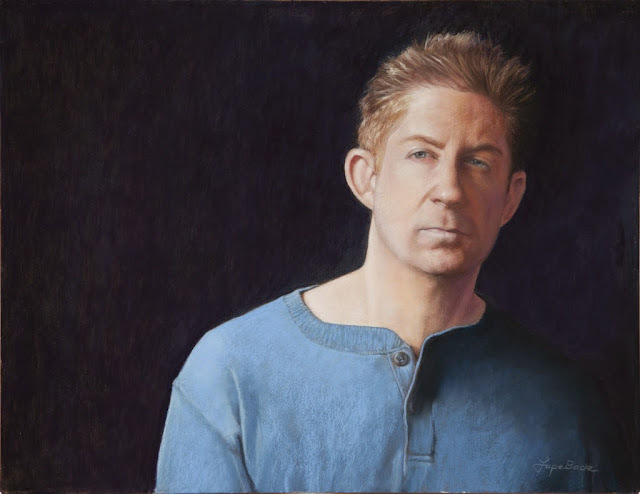 Art on the Side: First Place in the Pastel Society of Southern California Member Show! First Place in the Pastel Society of Southern California Member Show! I started this portrait last year in June. I thought it was time to try my freehand drawing skills to start off a pastel portrait. After all that's why I've been practicing my draftsmanship. I found a quirkly self portrait that Marty had taken when he was goofing around with his photographic equipment. When I first saw it I was amused since the expression was so uncharacteristic of him. To me it said, "Hey, what you looking at! ", "You talking to me?" It exuded a defiant and cocky attitude and I wondered if I could ever manage to capture this in a portrait. It would certainly be an interesting challenge. 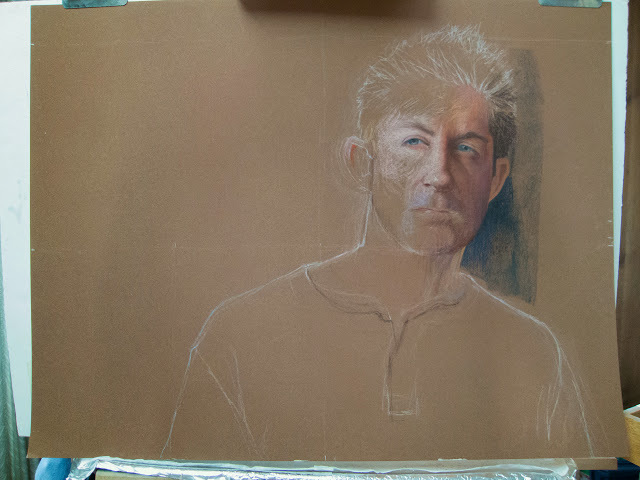 The paper was a 19 x 25 sheet of La Carte pastel paper in Sienna Brown. I took care with my initial drawing. I drew lines dividing my paper into quarters as well as on my reference with the same aspect ratio. These guided me in placing the off center figure accurately on the paper. These also help me place landmarks for the top of his head and rest of this body so as not to end up with a drawing that wandered out of bounds. Once the sketch was done to my satisfaction I started applying the pastel. I hobe it's okay when I write to you this way. Unfortunately I couldn't reach you by mail. I've come to your blog by accident searching for hyper realistic drawings. I'm really impressed and want to express my appreciation! I'm an 53 year old amateur painter from Germany, up to now I've mainly used acrilic colors. I've met the link to your blog to the list of my favorite artists on my website www.arteio.de. If you have any objection please let me know and I'll remove it immediately. But your fascinating works seemed to me worth it! I wish you continued fun and success with your drawings!